1. Our fees are the lowest of all tutoring companies companies, that offer 1 on 1 tutoring. We offer trained top tutors that keep students from failing and raise their test grades. We have no contracts for our services. Pay as you go! PHD and Master's Degree level tutors for all subjects. 2. Our Money Back Guarantee! If your not happy after your first two tutoring hours or lessons, we will give you a full full refund. In addition, free evaluations included with our 1 on 1 tutoring program. 3. 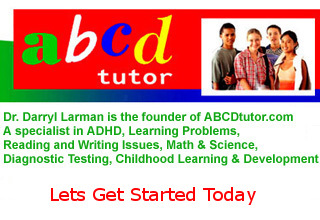 All tutors personally selected by Dr. Darryl Larman, an expert in Learning and Development and a Teacher Trainer who developed the Standards for the Government on how to rate and train a good teacher. 4. Dr. Larman's Research can be found in the Library of Congress and his research demonstrates how to raise student's grades and raise student's I.Q.